Jomax deck cleaner is highly recommended for getting rid of tough mildew stains. Unlike most traditional deck cleaners, Jomax comes in powder form, not liquid. The powdered deck cleaner is sold in one-pound bags and must be mixed with bleach and water to activate special detergents. The easy-to-use powder eliminates stubborn mold, mildew, and algae from wooden and concrete decks. The powder concentrate can also be used to clean wooden fences and vinyl siding. One of the outstanding features of Jomax deck cleaner is its oxygen activated foam formula, which removes heavy-duty mildew and grime. The product also restores weathered wood decks thanks to its active ingredients. Jomax is one of the only mass marketed deck cleaners that uses oxygen bleach technology. Oxygen bleach should not be confused with ordinary household chlorine bleach. 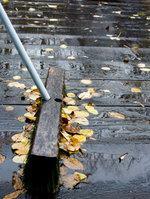 The active ingredient in chlorine bleach is sodium hypochlorite, which can have harsh effects on untreated wood decks. Oxygen bleach is a powerful cleaner, but doesn't contain the same level of toxicity as traditional bleach. The chemical makeup of pure oxygen bleach is simply hydrogen peroxide and soda ash. When you mix oxygen bleach with water you create oxygen bubbles that work to eat away at dirt and mildew. The solution soaks into a wood deck and the oxygen ions break apart mold, algae and mildew molecules. Since Jomax cleaner for decks is not made from harsh chemicals, you don't have to spend hours covering and protecting the trees, plants and bushes around your deck prior to cleaning. Jomax is much safer for the environment than straight chlorine bleach. When you rinse the product from your deck you don't have to worry about it negatively effecting the vegetation surrounding your deck. Another plus is that the powder-based deck cleaner by Jomax is highly economical. The product costs less than other deck cleaners because you have to mix it yourself with water and a little household bleach. What's more, Jomax deck cleaning solution can be found at most home improvement stores. On the flip side, since Jomax is milder than deck cleaning solutions that feature large amounts of undiluted bleach; it does require some elbow grease to effectively clean large areas. Jomax touts its product as a no-scrub cleaner, but you will likely find more success in getting rid of mold by soaking a scrub brush on a pole in the deck cleaning solution and then gently rubbing the product on heavy-duty mildew stains. Despite the fact that Jomax deck cleaner is milder than most of its competitors, you should still handle it with care. Avoid getting the powder on your skin and clothing. You should also take care not to breathe in the powder-based deck cleaner. After cleaning with Jomax, wash your hands and clothing thoroughly. When you are not using the product, store it in an airtight container in a cool, dry, well-ventilated area. Do not store Jomax cleaner for decks near flammable materials. Finally, redwood and cedar have natural characteristics that require special treatment to enhance their beauty. You should never treat a wood deck with Jomax until you have tested the product on a small, hidden area on your deck.